HIDDEN TREASURE (Heart of The Woodlands)- Estate Sleeps 14. 4425 Sq. Ft 5 Bedroom, 4,5 Bath, 3 Car,2 Story. A Place For Work And Play. We have a newly renovated home with all you could wish for, whether it be a weekend stay or longer work related stay. The house is fully furnished with kitchen wear, bedding, furniture, DirectTV, a pool table and ping pong table. The home is located in The Woodlands, with a Spring TX zipcode. The Woodlands is a very well known area of Houston ranked number 2 on the best places to live polls. Everything is here, those who stay do not leave. This home (full of large windows) is nestled amongst the natural outdoor beauty and the town has a small town feel. It's very possible to see deer running around in the backyard. We work and play in the woodlands without having to leave. There is so much to do. Try a ride on the water taxi around the canal, or take a trolly ride to your destination. Lots of choices of restaurants and small boutique shops can be found in Old Town Spring, Market Street, The Waterway, The Portofino, The Woodlands Mall, or venture downtown. Market street is a wonderful area to shop and dine while your children play in the park. We have three movie theaters, top golf not far away, and several high end golf courses around.We are close to the George bush international airport and 25 minutes to the nightlife of Houston downtown. The Woodlands has lots of lakes for boat activities and your grocery stores and restaurants are hidden away behind the trees. There are long walking trails where you see the joggers, walkers or bikers each day. Plenty of parks to picnic and relax on the grass.There is music in Northshore park each weekend where you can let your children play. We are located in very close proximity to emergency hospitals, and a world class Texas Childrens Hospital 15 minutes away. Many come from all over the US to come to our amphitheater where we have famous artists such as Lionel Richie, Lady GaGa and many more. I look forward to your stay! Hello, I am so excited to share my newly renovated home with you. I am a 23 year old U of H graduate who has a passion for Finance and staying at home with my babies. I find great enjoyment in meeting new people and corresponding online with my clients. I love learning why people are coming to visit, and seeing such different personalities from those all over the world. This has been our rental property for about 3 years, and we have decided to stick with it since I enjoy it so much. I have spent a lot of time decorating it well and would like you to enjoy it and treat it like your own. I look forward to hearing from you. We love this home as it has a very Mediterranean style look about it. It has a lot of land to run around and the neighbor-hood is great.This is a very nice area and up and coming, and a very well known area. The home is close to the airport and close to woodlands mall and all the activities. The woodlands itself is like a resort of its own, and is 5 minutes drive to the nearest grocery store. There Are 4 Full Bathrooms And One Toilet Area. The Biggest Bathroom Is Attached To The Master Bedroom With A Nice Large Deep Tub And Shower For Two. Then We Have The One Jack And Jill Bathroom Which Is Shared Between The Two Bedrooms, And Lastly One Private Bathroom For The Fourth Bedroom. Our home is across the street from a real nice lake where you can fish or go canoeing. This is the view we see as we enter into the neighborhood to get to our home each day. We have two fireplaces with natural wood burning logs. We have a very long driveway for your guests to park and two parking spots designed for the work crew to park at the end of the driveway. Extended 3 car garage, attached to the home. We have a family room off the kitchen where the children watch TV and a formal living room for special dining. Large built in upstanding stainless steel refrigerator. Fridge on top and freezer below. We have two ovens and a wolf 5 burner stove. You can cook a lot of meals at one time. Two built in ovens, also stainless steel. Gourmet kitchen made for a chef. Granite countertops, stainless steel appliances, wolf 5 burner stove and island. Kitchen looks into the family room. We have a nice dining room with a very unique antique door look. Sits 8 people, just off the kitchen. Great location, driveway was smaller than expected. Garage is awesome. House met all our needs. The home is lovely and spacious. My family was very comfortable and really enjoyed the home . The owner is very helpful and kind . She had everything set up for us upon arrival and made us feel at home . You won’t be disappointed staying at this home and a plus is that it’s very close to shopping malls and stores . I will be booking for future stays ! Thank you for choosing to stay with us in The Woodlands. You are welcome back any time in the future. I’m glad we could share it with you. Thank you for the nice review. It was such a pleasure to host your family on Thanksgiving at our home. You are welcome back anytime in the next future. Thank you for choosing to stay with us while here in town as i know how important it is to be among family and friends. We thoroughly enjoyed our stay at this beautiful home. The accommodations were perfect for our large family. The central location to grocery stores, mall and major highways made it convenient to travel in and about the area. We also used the subdivision community center which was only a mile away. The pool and fitness room were loved by all. Both Ashley and Amanda were very helpful and responsive to all our questions. I would definitely recommend this home to anyone visiting this area. We had a woderfull time. Tha house is awesome. The owners went above and beyond to make sure we had a great stay and were satisfied with our home away. We enjoyed staying there for our family event. 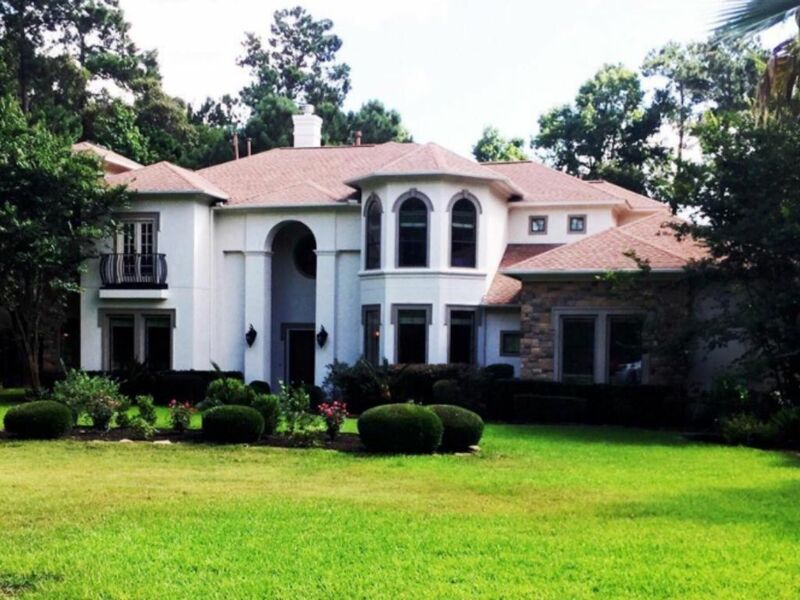 A large luxury home hidden within the woods of The Woodlands Texas. The Woodlands is about 30 minutes from Downtown Houston, where they have the top medical center of the USA, NASA space center, top rated Museums in the Museum District, live theater productions, the Houston Zoo, and exciting city life. This home is far enough away to experience the suburban lifestyle full of outdoor activities (e.g. concerts, festivals, swimming, running, biking).